This year for the Stitch n Craft challenge the theme was ‘Anything Goes’ – so no theme, no packs, no requirements, just enter something you’ve worked on this year that you’re proud of. So I beaded away at a particular thread of an idea, and was getting really pleased with it when I realised it didn’t really meet a key requirement to use some beads bought from them. Yes the core of the work used their beads, but the flashy bits, the visible bits were all from elsewhere. So this didn’t really feel to me like it was entering into the spirit of the competition, so although I ‘d already paid the entry fee I decided to pause for a little think. Whilst I was thinking (OK procrastinating) the theme was announced for another competition that fit my nearly complete piece perfectly. In every other way that competition seemed like a better fit for it, so I decided to enter something else at Stitch and Craft instead – another one of my big bead embroidered necklaces perhaps, using beads that were definitely from them and some of my own cabochons? Digging around I found a set of experimental cabs that I made in the early days using the left over paint mess from a salad spinner painting session with the boys. Surreal but true. The drips and dribbles gave an acrylic pour effect, and I’d even tried mopping up the excess paint from the side of the spinner by blotting, giving a lovely blotchy effect which I’d then used to make a huge 50mm cab. The large cab made me think of Monet’s waterlily paintings, particularly those in the Orangery in Paris, where if you stand close the beautiful paints form gorgeous abstract patterns. In turn that made me think of water, with silvery bubbles and that got me to my base colour scheme of silver, etched vitrail and metallic mint green (Miyuki 4214 and 4214F), and I started my usual process of pulling out a big range of beads to kick start the design process. A stash search unearthed some vitrail ridged back cabs from The Old Bicycle Shop, and a wonderful crumple backed oval Crystal Electra geode cabochon from Stitch n Craft themselves. The colours though were still a bit subtle, and I needed to call on more of the contrasting colours in the cabs and crystals, so I added some pink – not my usual fuchsia though, but a more subtle Swarovski Crsytal Peony Pink (again from Stitch N Craft). And finally I spent some of my Beadworker’s Guild Founder’s Award prize money on some gorgeous Anna Bronze findings, this time in an antique silver finish, but repeating some of the organic shapes I’d used in that piece. Then I got stuck in, using what is becoming a standard process for these type of pieces. First I did a rough layout and photographed it, then rather than bezelling onto a single backing I bezelled each of the flat backed hand made cabs onto a separate piece of backing. I do this because I find that adding the bezel changes the shape, size and overall appearance of the cab, and usually means I want to alter the layout significantly (usually to add more space). I used a simple backstitch/peyote bezel – quick and secure, adding a picot to some but not all. 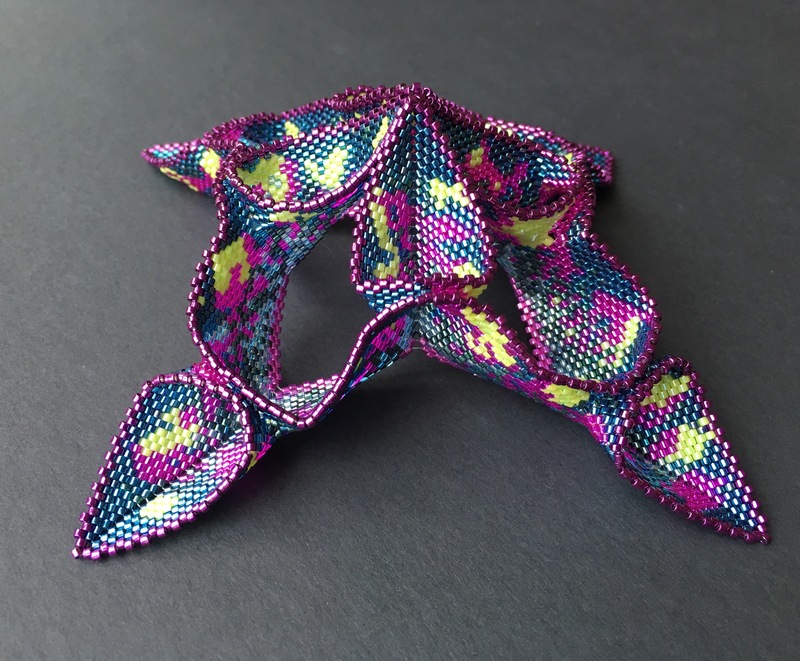 If you want to learn how to do a basic back stitch/peyote bezel then take a look at my SunStar tutorial which takes you through this technique. Then I did the beadwoven bezels for the crystals and other cabochons – biggest first, then using a variant of whatever bezel I came up with for that one (with less repeats, or smaller beads) on the smaller ones to give a sense of continuity, and a repeat of the method I used on my Great Dixter necklace for the chatons. Then I looked at layout again, adding the metal pieces, and did my trick of deciding on a shape based on a specific neckline – in this case I’m really glad because the original layouts had been for quite a shallow ‘v’ which wouldn’t have been great in wear. Then I was ready to start attaching the bead embroidered cabs to a fresh base, using both glue and stitching (these are big cabs so it’ important to be secure, particularly if there is any flex in the finished piece as this could break the glue bond on bending). Then I checked the layout yet again, working out how I would attach the bead woven cabochons (which sit up above the base and bead embroidered cabs, and where and how to attach the metal pieces. This showed me what space to leave free, and where I needed to cover the base with bead embroidery – which I then did using simple stack stitch, and supplemented with some lovely Backlit Spectrum and Etched Vitrail 2 hole cab beads (in my head these were the bubbles in the water). Next the attachment points for the straps (I didn’t complete the whole strap, as I wanted to check the length with the finished centrepiece, but I chose the beads, got it started and reinforced it repeatedly), and then finally I was able to secure the metal pieces and crystals. At this point it was becoming apparent that the 50mm cabochon was pretty heavy. Inevitably the bead backing is weakened as well when you stitch into it, so it was time for some serious reinforcement, sandwiching, glueing and stitching on additional sheets of backing, and even some flexible plastic cocktail sticks. Of course those are hidden by the beading above, and the ultrasuede behind, so once that was on I worked on the edging, adding a picot to the focal cab and a simple sunshine edge to the remainder. The neck strap of backlit 2 hole cabs was completed with simple loop and a vitrail Czech button from Snoochy, and then the whole thing was posted off to Dorset. You can see all of the entries here on the Stitch n Craft website – in the end I was beaten on the day by Chloe Menage’s gorgeous bead embroidered headpiece, which she’d made for her own wedding. However that’s not really why I enter competitions – it’s to stretch and challenge myself to do something original and ‘me’, and I’m still really very pleased with this piece. It’s the third I’ve made using this process (the first was my ‘Diva’, the second ‘Great Dixter), and each time it gets a bit easier, and a bit more enjoyable. It was the last Stitch N Craft Beady picnic (and probably the last challenge) as they’re closing the studio to focus on mail order only, so as I’ve enjoyed them so much over the years I was really glad to be able to enter again this year, and I’ve got a lovely necklace to show for it too. Apologies (yet again) for the quietness here and in my shops. I’m working on two separate competition pieces at the moment, which means I can’t really post about them, but in between doing and re-doing them, I’ve finished another piece which this post is all about. It’s a necklace I made for a concert – as a soloist I had an opportunity to make something with all of the enormous crystals I’ve been hoarding and dress up the plain black velvet dress the piece (Faure’s beautiful Requiem) required. The concert went really well, and the necklace gave me an extra confidence boost. Sadly I forgot to take pictures on the night but I have been taking them as I made it, so I thought it would be interesting to describe that process. So – how did it come about? I’d bezelled several modern and vintage crystals from my stash already using my usual MRAW into Peyote bezel, as I’d intended to use them for another piece, but it didn’t work out so they were sat in my workbag. When the solo came up it seemed like the perfect chance to use them, so they were my starting point and set the initial colour scheme of silver, light matte pewter and etched vitrail with plain crystals. Grouped together the bezelled crystals didn’t seem big enough to occupy the very deep V shaped neckline of the wrap style dress, so I had a root around and found a huge labradorite cabochon. I mounted that on some grey Nicole’s Bead Backing, and cut a rough shape, adding wings at the top to join to the crystals. I bezelled using back stitch and then peyote, alternating bead and no bead on the final row for textural interest. A back stitched row of tiny 2mm etched granite fire polished beads finished that part. Next I had to decide how to put the piece together. Because I was making for one very specific occasion, and one dress I wanted to use the shape of the dress to really enhance the piece. So amid much laughter from my long suffering husband I cut a section out of a piece of A4 paper to leave room for my neck, then stuffed it into the front of the dress and drew the outline of the dress’s neckline onto the paper. I also added a rough sketch of what I though the ideal shape would be – following the lines of the dress but giving a gap so that the piece would be nicely fitted and framed – giving me a probable outline and an idea of the space I would be working with in case that outline had to evolve. Then on that paper I tried lots of different layouts, placing the bezelled stones in different combinations and positions until I settled on one. Next I needed to form a base – I’m not really used to bead embroidery, and had bezelled all of the crystals with a peyote band off an MRAW starter – only the labradorite cabochon was mounted on backing, and the backing was very small (poor planning on my part – I should have just worked on the full sheet and cut down later). I had intended originally to link the stones with beads, but I had a change of heart and decided to back them instead, so I tacked an additional bit of backing onto the cab piece. I kept it quite narrow (about a third of the finished width, rather than the full width) as I wanted the bezelled crystals to sit independently of any base, and to avoid the breastplate look so beloved of some bead embroiderers, as it’s just not to my taste. This was almost certainly extra work compared to bezelling straight onto a backing, but it did allow me to avoid issues around the crystals not being flat backed, and I think the end result looks good. So anyway, eventually the bezelled crystals were stitched in place onto the backing. Next I covered some of the backing and added some edge interest by stitching on some faceted drops – I had bought these a while back and they seemed to pick out the blues and purples in the labradorite. Then things seemed to be getting a bit too flat, so I wanted to add some height – I beaded some herringbone rope which I nestled between the asymetric crystals (they were starting to look a bit like leaves) and then twisted and twined above the central stones – again using etched vitrail, with 8s in the central section and 11s either end to nestle into the gaps. A couple of matte vitrail etched spikes filled in some more gaps and gave more textural interest, and a gorgeous waterlilly chaton with a rather risky minimal bezel broke up the rope a bit. I used stacking (one large bead caught down and through with a smaller bead – in this case a mix of 8s and 6s caught with 11s) to fill in the remaining backing – again in the etched vitrail which looks absolutely amazing on the large 6 seeds, and then I was ready to think about a strap. I had originally intended to use silver chain because I had expected it to be covered by the dress, but a quick check showed this wasn’t going to be the case, so I felt something which continued the textures round, but was still quite delicate would be a good idea. Another herringbone rope seemed called for, but I don’t have much luck with preserving a perfectly even tension on these, and with the etched beads this would be even more challenging. So I went through my bead books and found a lovely delicate spiral rope in a Marcia DeCoster necklace – a bit of substituting gave me a central core of silver 11s, with an outer spiral of etched 11s surrounding either an etched 3mm or an etched 8. I haven’t used spiral rope for years, but I actually really enjoyed it (after all the experimentation and fiddly bezelling earlier it was quite a relief to have something straightforward and repetitive). While this was going on I backed the main piece – I wanted to secure the ropes to both the bezelled crystals and the backing first, and then I decided to order some grey rather than using the black ultrasuede I already had – I think it was worth the wait. That then allowed me to edge – I had planned an extravagent fancy edge, but once I’d put the first brick stitch edge in place that felt like enough for now. One last quick try on set the length for the rope, and I then followed Marcia’s example and used a simple loop and a rivoli I’d bezelled earlier to form a catch. Rope complete, it was finally time to mount my favourite crystal – an unbacked vintage stone, which I’d given the barest of netted bezels, and wanted to use free of backing to display the capturing beads and the transparency. I had hoped to link sides and base with crystals, but wasn’t happy with the visible threads, so I came back to the fire polished etched beads, and then off to seeds. Then I tried the necklace on and found that the unbacked crystal was digging into the base of my throat slightly, which would have been a real distraction when singing, so I snipped the whole thing off again. That would be why you’re always told to start new threads to do attachments – makes it much easier to simply change your mind! That left me with a rather boring top edge to the central area, so another bezelled chaton attached at an angle broke that up nicely, and hey presto ‘Diva’ (what else could you call a necklace for a soprano) was complete. Large asymmetric crystal – cheap local bead shop which has since closed! It’s a good long list – I do seem to get around a bit! Last week I was hunting for my wire box (which should have been labelled, but the small people like to take the labels off, presumably to make life more fun), when I happened upon the UFO box. This should really be called the failure box, since this is where I put things I’ve given up on (genuine UFOs which I intend to finish live in a different box in a different room, and I’ve already blogged about them and done nothing to them since). Amongst a tangle of hopeless failures and technical disaster zones I found several viable pieces, which I think got thrown in there in a hurry when I was clearing my stuff out of the spare room before we had the smallest boy. As he is nearly two and a half you can see it’s been a while since I looked in there, so it was a pleasant surprise to find so much usable work! There were also some lovely beads and a finished pair of earrings…….. The black net base for a Racel Nelson Smith Ootheca cuff. Part of another Rachel Nelson Smith piece in lovely earth colours. A finished black and white hollow cube – a sample with more zip beads on the corners than I now do, so an early point in the evolution of this series, but I now think rather fun. Some lovely mushroom beads, and a pair of earrings made from them. A couple of salvageable beaded beads – the giant pewter ones has issues at either end, but can be embellished to hide them, and the blue one was an attempt at using RAW which didn’t go well, but will be fine as an Anenome base. The teeny ones were going to be part of a big piece, but bored me. They will now be a nice little pendant, hung as a trio. A khaki and copper attempt at a sea urchin design, which failed as an urchin but could make a rather nice hollow beaded bead. A long piece of peyote with graduated delicas that simply needs zipping round a wire core to make a necklace. Assorted beads, stones and bits and bobs. I did find the wire in the end, but got distracted and haven’t used it yet. Tomorrow……. I’ve been working really hard on a competition piece recently, and after a month’s solid discipline I fell of the wagon last week and wandered off into other beading. I’m sure the break will be good for me, but none of the other beading really worked and that made me rather antsy. When this happens, there are two options – have a night off beading, or do something which can’t fail. I didn’t want a night off, so I turned to my stash of digital patterns to find something by a designer who never lets me down – Sabine Lippert. Just before Christmas she had a pattern sale, so I had a little splurge on a few patterns, including her pendant ‘Sting’. This looked like something which would be achievable in an evening or two, so I pulled some beads and got going. It was a good decision – as always with Sabine’s designs this piece went together very nicely. It took around 3.5 hours – I’m used to Sabine’s designs so can usually work them up quite quickly, and I found this one pretty easy, with everything just slotting together perfectly for a contented evening’s beading. It’s given me my beading mojo back, and with some child free time off the day job coming up, I feel refreshed and ready to get some of those long awaited tutorials finished and launched soon. Spikes – Dark Bronze. I have no idea where they came from! 3mm Round – I didn’t have any in the right colour, so I used some Saturated Fuchsia firepolisheds from Robin’s Beads, which worked well. 6mm Round – I used an orange FP, this can’t really be seen so you just need something that tones in. The ribbon (I know it needs a press, it’s been lurking in my stash for ages) was hand dyed by Stef Francis, a fantastic space dyer who I came across in my sewing days. I usually find my tension too tight for Sabine’s pieces, because of the 3D embellishments and layering. So I relaxed things a bit, but unfortunately I shouldn’t have done as this is one which requires stiff tension to create a solid rod of peyote, so it came out a bit floppy. However, I have stuck a head pin down the middle and it’s fine! Sabine does warn you about this in the blurb on her site, but not in the pattern. Because I’d bought the pattern a while ago, I’d forgotten what the blurb said, but to be honest a beader of my experience should know that if you want to make a peyote tube rigid you’ve got to do some pretty solid stitching, and use a suitable thread – Sabine recommends Fireline explicitly in the materials list (which should have been another clue) but I’ve gone off it a bit, so I used KO which is clearly not going to give the same rigidity. So entirely my fault, but a useful learning experience (just when you think you have things sussed…..), and it still looks fine. If I make this design again, which I probably will, I might perhaps stick a cocktail stick down the middle for extra stiffness anyway (the head pin I used is after all flexible). One of my resolutions this year is to include more neutral colours in my beadwork – I have a tendency to chuck colour at things, which sometimes gives me an amazing looking piece which is completely unwearable. I try to avoid beading with black as it’s hard work, and anyway I wear a lot of navy blue rather than black, so I’ve been using a lot of 401FR and similar to give me a navy base. I’m also getting really into pewter, and other matte, mid greys, as they work well with the etched beads I’m currently obsessed with, so for this piece I chose a selection of those tones for the base beads, and variations on a dark salmon pink for the main colour. I toyed with a few different spikes (which you can see in the materials picture), but in the end the dark metallic chocolate worked best. This was going against my instincts, which were to pick out the fuschia and orange of the stone, and maybe chuck in some zest, but I think it’s worked well and given me a striking but wearable piece, proving that this is a good resolution! A lovely piece, well worth buying and trying. Rock hard tension and the correct thread would have helped keep the main shaft rigid, so always read the instructions. I’m going to get back to my own work for now, but next time I need a break I’ve got Sabine’s Toggle Ring tutorial to try. After my obligatory blogger’s 2015 review, here’s my equally obligatory 2016 look ahead! Thank you to my sister Susie for the apposite mug – it is sadly true as I spend a worrying amount of time thinking about what I want to bead. This is probably because I have so little time to actually bead, so this year I want to make a plan and sort of stick to it, so I can always have something on hand ready to work on (rather than sitting around waiting for inspiration to strike because I’ve forgotten that really good idea I had three months ago). So to begin, the projects I started in 2014 and didn’t touch in 2015 – the dreaded ‘unfinished but not quite a UFO yet’ box. Planned for me to wear at my friend Jane’s wedding in the smartest venue imaginable. Abandoned when I decided the dress was too short for said venue. This was going to be a series of arches to mirror the digital print of the Ted Baker dress, and I think I’ll continue trying to work it out as it’s a lovely dress. That said, when I pulled the bits so far to take a snap I wasn’t very impressed…….so for now this is back in the ‘maybe’ pile. Planned for me to wear at same wedding with smarter outfit, just as a simple short necklace. Abandoned when I realised said outfit now too small. I have plans to turn this into a shoulder covering cape of bezelled stones, connected by a cobweb of antique gold 3mm fire polished beads, but it could take a while to bezel enough stones for that! The stones are a mix of vintage and new Swarovski, and were a very good exercise in working up similar bezels in lots of shapes and sizes. I’m a lot more confident in this one though, so it’s high up the list to actually do. It would be a good holiday project as I’d only need the gold beads and chatons (not my normal case full of random pulls). These are a variant on Jean Power’s Geometric Secret vessels – only with triangles instead of hexagons. They’re lovely shaped things, but the one in 15 delicas (at the front) is rather more succesful than the one in 11s as it holds it’s shape, but I’ve never quite known what to do with it as a triangle is not a very wearable shape – it sticks out rather. It could make a nice pendant hanging below a suitable bosom I suppose? Not sure what to do with the other one? Back on the ‘maybe’ pile. This one may not make it – I was playing with twin beads to make a flat weave, but I’ve run out of the twins and can’t remember where I got them. Luckily I do in theory log all my purchases (so I can cost up work/kits), so I should be able to work it out. If I finish this it will have a long or box clasp and sit as a snug cuff, and I’d like to as it is my colour. I’d say there is no more than an hour’s beading left to do once I’ve sourced the beads, so stays on the ‘to do’ pile. Maybe I should have included a section on ‘pieces where I’ve run out of beads’ – this one qualifies as well……..it will be a necklace once I’ve worked out how to elegantly extend it to a normal length (or tracked down some more beads). This would make a nice beginners tutorial as it is super easy, but I think there are already quite a few similar ones around. On the ‘to do’ pile. This is a barely started Jean Power Affinity Bangle – using very cool rubber coated rondelles from my now defunct local bead shop. I think I have enough to get me through it (I kept buying more in their drawn out closing sale), and I’ve made one before which was a joy, so I want to get going on this soon as the colours are more winter than summer and I think it will be lush! So, that’s the really old stuff out of the way – just tutorials, last year’s unfinished pile, my long list of unstarted patterns and of course a ‘to try’ inspiration list to go. This could be the longest set of New Year’s resolutions I’ve written (hopefully I’ll be better at sticking to them than I normally am). Tune out if you get bored…………. I’ve finished my latest Contemporary Geometric Beadwork influenced piece – a large pointy bangle. The idea with this piece was to work with the ideas from CGB, but for the first time to ignore their finished pieces and patterns and see where I ended up. I also wanted to work with a tube of sweepings from Stitch & Craft, to free myself up from the hours I tend to spend selecting colours! 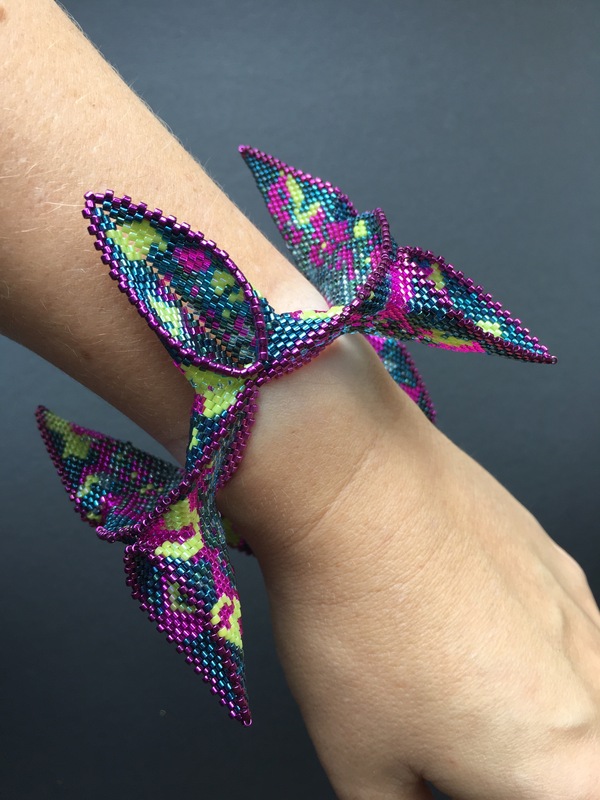 I started with a MRAW band which I thought would be roughly the right size for a bangle (I was wrong – it was huge), then added some increases and decreases to form a zig zag. I beaded that for a while, then added some increases halfway along each side to start to form peaks which I thought I could join together to start to shrink the piece down and make it human (rather than elephant sized)! I planned to add some crystals to join the peaks together, but when I tried it they didn’t work, and left the piece a bit too wobbly. After some unpicking I decided to stick to delicas, joined the peaks and beaded across either side of the join to make continuous lines and curves, surrounding the whole piece with a dark magenta metallic outline. At that point I decided the original MRAW band wasn’t sitting correctly – the alternating zigs and zags meant that it needed to point in different directions so I couldn’t turn it into a CGB skirt to firm up the shape and make it smaller. 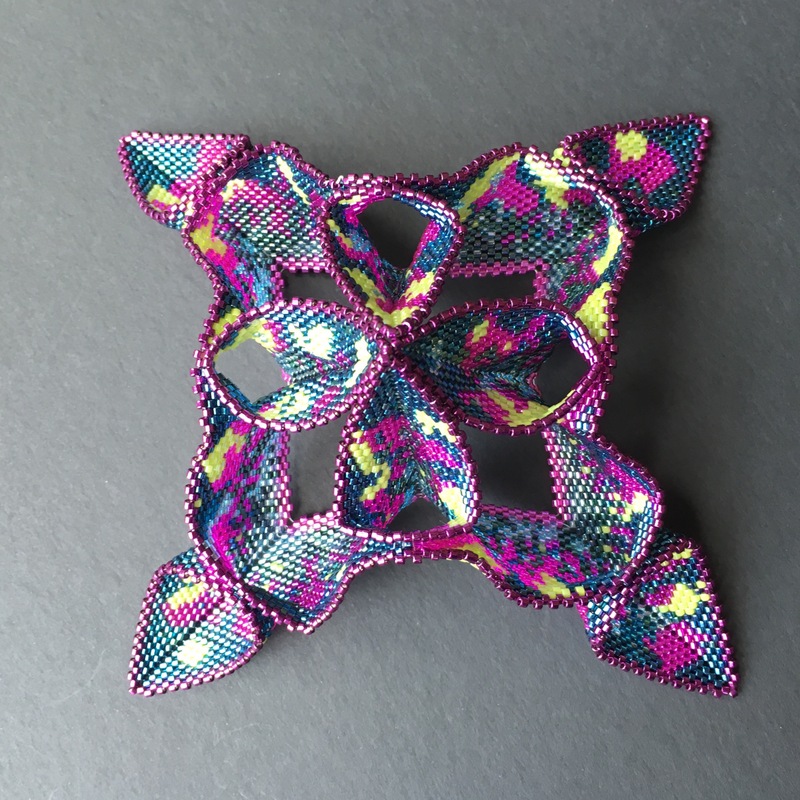 So that got unpicked from the inside out, and I added a couple of rows of peyote in fuchsia metallics, and the decreases sorted the sizing out. So it’s all done, and available in my Etsy shop. It’s also my entry for the Etsy Beadweavers Team October Challenge – ‘Abstract Painting’. If you’ve got a moment pop over to our blog and have a look at the other entries (or search ‘EBWC’ on Etsy). And if you could take a few seconds to vote for your favourite we’d really appreciate it.